Philips BlueVision Automotive Lighting creates active safety technologies that are designed to illuminate your car, secure your road, and enlighten your world. Interweaving technical innovation with a genuine concern for the safety and driving comfort of those drivers who benefit from their products, Philips BlueVision lamps bring the driving benefits (and stylish looks) of brilliant white daylight to all cars equipped with Halogen lamps. 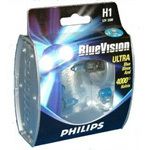 A longer lasting Philips BlueVision blue light. Drivers would love to drive in daylight 24 hours a day, Bluevision gives off a daylight effect to help you achieve this. The whitest light (“brilliant white daylight”) at (up to) 4000° Kelvin. The brilliant white daylight produced by BlueVision lamps enhances road-sign and roadmarking reflections. The task of driving at night suddenly becomes a pleasure as drivers are less tired and able to better anticipate all driving challenges. The same high quality and excellent beam performance found throughout the entire range of Philips Automotive lamps. 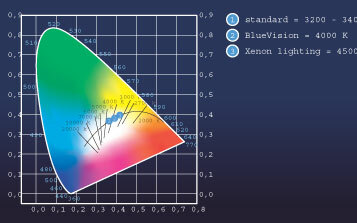 BlueVision turns night into day and gives your car an executive look. Active safety stylish looks of brilliant white daylight at up to 4000°Kelvin.